This map shows LDS population by state. All of it makes sense to me, except for Maine. And Alaska? Maybe Maine and Alaska are skewed by the fact that they have low populations overall? Just a guess. I was a little surprised by West Virginia. I suspect some of that is DC-spillover, but I would have thought those Mormons were in Maryland rather than WV. Clayton Christensen has told the story of the growth of one branch/stake of the church in Maine, which might be the beginning of an explanation for the “high” percentage. See the pdf at this site site, beginning on page 8. During the first week of September, the number for Maine will briefly spike since my wife and I will be in Bar Harbor then. Can’t wait! According to Greg Kearney, in his 2005 interview with John Dehlin, David Whitmer established a pretty large congregation in Western Maine in the 1840s, which took a sort of “wait and see” approach to the succession crisis after Joseph Smith’s death, and therefore did not gather to the Midwest (to joint he RLDS) or to Utah (to join the LDS), as most converts around that time did. Then later on, missionaries from Utah brought the Maine remnant into full fellowship with the Utah saints. I don’t know the full history, or the size of the congregations, but if this is true, it could account for a relative large population base in comparison to other northeastern states where converts were gathering to Utah (or perhaps to one of the RLDS communities in the midwest). But this is conjecture. In many states n ~= 300 including Maine so I’d suspect simple poll error. They have the data in tabular form including n.
Just to clarify that comment for those not familiar with statistics. With 303 people for Maine and a stat of 2% thats 6 people saying they were Mormon. Each person accounts for 0.3%. So if the actual percent is 1% that means they should just find 3 people. But if by chance two people were picked up beyond this we’d get a 2% rather than 1% figure. Of course it might also be that there just are more Mormons in Maine than surrounding states. But when two people can change the polls that much we should be a bit critical. I think Clark has solved the mystery with the map in the OP. If n is 300, you’re going to have a lot of sampling error. If they did the survey again, they might very well find zero Mormons in Maine. 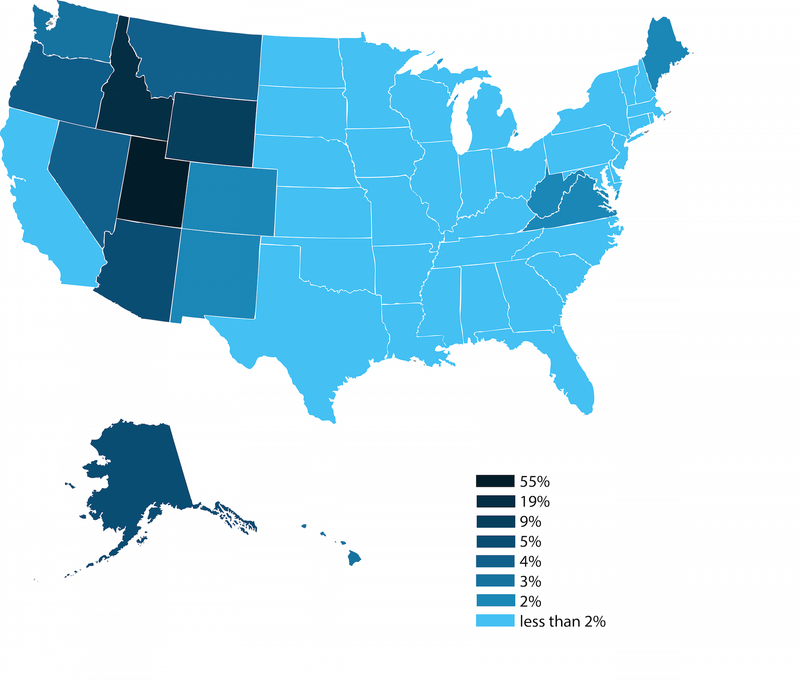 As of 2009 they put Mormons at about 0.8 percent (much less than the 2 percent in the OP map). But Maine still has about twice the percentage that Massachusetts and Connecticut have. So that’s something. Also, while the use of color in the map is visually stimulating, the perceived gradient between ‘less than 2%’ and ‘2%’ is greater than the gradient between the other intervals. There could, in theory, be a very small difference between Maine and adjacent states (more readily explained through sampling error), but that difference appears to be much more meaningful (avoiding the term ‘significant’) as a result of the coloring. …also, look at those intervals. Really? Less than 2, 2,3,4,5,9,19,55. Obviously, 9, 19, and 55 each represent specific states, but that’s pretty poor data display. While, as I indicate above, this may overstate Maine, it seriously understates the difference between Utah and Idaho and the rest of the states. I haven’t done it, yet, but it might be worth taking a look at LDS Maps to see graphically the number of chapels in Maine. It wouldn’t be a dispositive effort, but it might shed some light on how Maine compares to its neighbors. All I know is I’m in a less than 2% state, no surprise to me. What seems weirder to me is how small the percentage is in California. Must just be the large population? Maine does have more members per county than many States but it tracks to the norm for New England and it’s not really an outlier when you look at the data more closely in a more statistically relevant study. They dont have internet connections in Maine? California’s population is massive, and Mormons are a small population. In the large, expensive cities (like the Bay Area) we’re *really* small. I think a lot of people have moved out of the state to less expensive areas, too. I recently visited my hometown, which is medium-sized and has a lot of agriculture. It’s grown by at least 20K people in the last 25 years. When I was growing up there in the 80s, there were five geographical wards and a large YSA ward. There were 33 girls in my YW program, and lots of LDS kids at my high school. Now there are 3 geographical wards, a teeny YSA ward, and few youth. A lot of families have moved to other states where it’s easier to make a living, have a bunch of kids, and have Mom stay home for a while. I’m not sure why there are so many Mormons in Alaska, but there are a bunch. In the Fairbanks-North Star Borough, home to 100,000 people, there’s a stake with 10 wards; take, in contrast, my home county in the Midwest, which despite hosting about 120,000 residents is only a fraction of my home ward’s geographical area. I think that the result for West Virginia is also largely due to small sample size. Virginia is somewhat more plausible due to northern Virginia suburbs. Alaska’s one of the few places in the U.S. where a male teacher can make a living wage without his wife having to work. The only two LDS families I know who are in Alaska are there for that reason. Plus, they get money from the government for just living there–money that’s paid out on a per-person basis (significant when you have five kids). Purely anecdotal, but possible contributing factors. Descendants of the many converts from the Cochranite movement? I went to the Community of Christ website to see how large their current presence in Maine is, and they list 10 meetinghouses, plus a mission center. LDS maps lists around 30 meetinghouses in Maine, so 10 additional meetinghouses is a significant number, although I don’t know how large the average Maine CoC congregation is (or how it compares in size with Maine LDS wards and branches). As someone who regularly visits Maine I found this question very interesting. We have found the people of Maine to be really great people, if that has anything to do with it. As for West Virginia, there are a lot of Mormons in the eastern part of the state. They’re far enough away from DC to be free of the internally created smog, but close enough that they can commute to work if they need to. Why use a sampling when we have total numbers? According to the official stats from the LDS newsroom, there are about 10,000 church members in Maine. (http://www.mormonnewsroom.org/facts-and-statistics/country/united-states/state/maine ) This is out of a population of about 1.3 million (per Wikipedia). That comes out to slightly under 1 percent. Kaimi, I think polls are useful since members of record isn’t the same as self-identifying members. There are also issues of how children affect the numbers. I vote for random chance. If there are 10k members in Maine according to Kaimi’s link, I would guess only a 1/3 to 2/3 would self identify as Mormon. So that puts Maine at under 0.5% in a poll of self identified Mormons. If that is the true probability, what is the chance you draw six or more Mormons from a random sample of 300 Maine residents? According to this calculator, plug in 0.005 for the probability of a hit and 303 trials and you get about 0.4% chance of this happening by random chance. Which is quite unlikely. But there are 50 states, so you get about 50 chances for a weirdo thing. Waving my hands around for this bit, 0.4%* 50 is 20% so there is about a 20% chance that at least one state would end up looking this odd. So it’s weird, but not super weird. If I am low on Maine self identification rates then it would be even less weird (or vice versa). If they do the survey again in five years and it happens again then either their survey method is off or Maine has an inexplicable Mormon boomlet. WV is NOT DC spill over. There was some early missionary work in that state. The converts just stayed. so your “1/3 to 2/3” estimate seems low for the PEW survey. Maybe 4/5 or 5/6 is more like it. And it looks like the 2% was already after PEW’s rounding (so there could have been only 5 Mormons in the sample). By the way, if you look at state by state numbers, you’ll find a number of states where the PEW survey reports a higher percentage of Mormons than the official church statistics, including Maine, Virginia and West Virginia. Nothing very statistically surprising though. ARIS tends to give a lower figure than Pew. 1.4% for self-reporting. Note however there are important differences between the statistics – especially on how younger people are counted. Without looking it up some only count those over 18 in the poll while others include youth. I’ve also noted that there are some reasons to be questioning of Pew data. I think some of their statistics just seem dubious such as their rate of tithing paying. OK, suppose ARIS’ 1.4% is right that is about 2/3 of members on the rolls self identifying as Mormon (I really doubt that 80% of people on our rolls self identify as Mormon), I may be shooting low on self-ID. So accounting for that, more than 20% chance of a 2% report off a base of under 1% (a Maine statistical glitch). Frank, I get a figure close to ? myself. However it is an extrapolation. ARIS is looking at those over 18. The rolls are those over 8. So they are looking at very different populations. One can make a few assumptions to guess how to shift from ARIS to the broader issue of those baptized and believing. It’s an estimate and I wouldn’t put much stock in it, but I attempted such a calculation a few months back. It was a post on Mormon retention and I figured would one get a retention rate of around 65%. Although there are various assumptions that might make the actual rate higher. Clark, my thoughts on retention are similar to yours. But i guess retention in this case is pretty loose since you don’t actually have to attend to call yourself Mormon. Yes, but there are people who can’t attend who I’d call Mormon. People not coming due to a job or illness. Further I’d say even people semi-active who still consider themselves Mormon should probably be considered Mormon. It’s the people who really aren’t Mormon in any significant way but who might be on the records who probably shouldn’t count. Part of the issue is Mormons consider a lot more activities to be required than nearly any other religion does. We’re definitely a high demand religion – far more so than others where people often rarely attend services. Still going by Pew (which I admit I have some concerns with) 82% say religion is very important in their lives, 95% say very or somewhat important, 83% pray daily, and 77% attend church weekly. 80% believe Joseph saw God. 69% put their religious commitment as high, 28% as medium. That’s ridiculously higher than any other group. Probably the key statistic relevant to Mormon self-identification as a strong Mormon is temple recommend. Pew has 65% holding a recommend (with 85% for college graduates). When you realize that included all people 18 or over, that would include a lot of people not yet with their endowments taken out. So that’s extremely high. Rule of small numbers. It is easier to get outliers and hot spots when dealing with smaller populations. Main and Alaska have relatively small populations so that a relatively small bump of converts could create the appearance of abnormality. This is a well known phenomenon. I would consider this first before wondering about special circumstances.